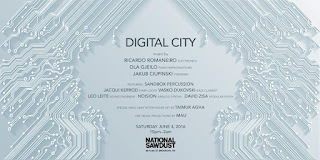 I an playing again at National Sawdust two times. First from 9-10pm with Vasko Dukovski on effected Bass Clarinet with sounds of New York City as recorded by Ricardo Romaneiro. Then from 11-midnight with Ricardo and other musicians for a special ambient pieced conceived and directed by Ricardo Romaneiro. Tickets here.